Antibiotic Resistance in Small-Scale Poultry Farming in Ecuador – microBEnet: the microbiology of the Built Environment network. The effects of animal agriculture on the spread of antibiotic resistance (AR) are cross-cutting and thus require a multidisciplinary perspective. 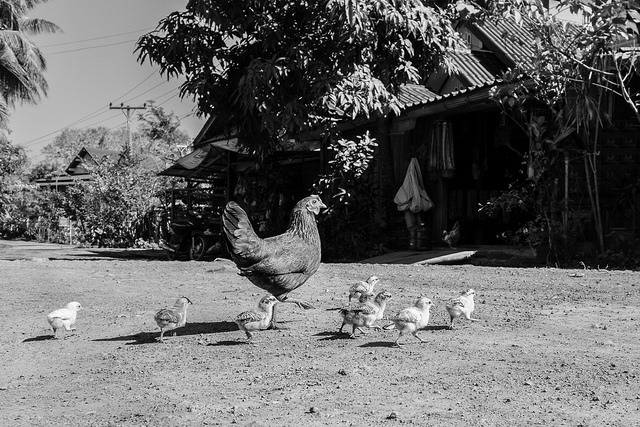 Here we use ecological, epidemiological, and ethnographic methods to examine populations of Escherichia coli circulating in the production poultry farming environment versus the domestic environment in rural Ecuador, where small-scale poultry production employing nontherapeutic antibiotics is increasingly common. We sampled 262 “production birds” (commercially raised broiler chickens and laying hens) and 455 “household birds” (raised for domestic use) and household and coop environmental samples from 17 villages between 2010 and 2013. We analyzed data on zones of inhibition from Kirby-Bauer tests, rather than established clinical breakpoints for AR, to distinguish between populations of organisms. 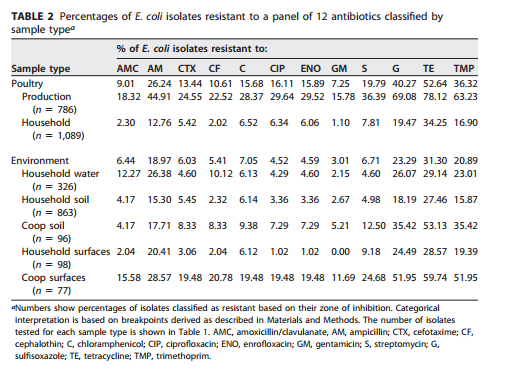 We saw significantly higher levels of AR in bacteria from production versus household birds; resistance to either amoxicillin-clavulanate, cephalothin, cefotaxime, and gentamicin was found in 52.8% of production bird isolates and 16% of household ones. 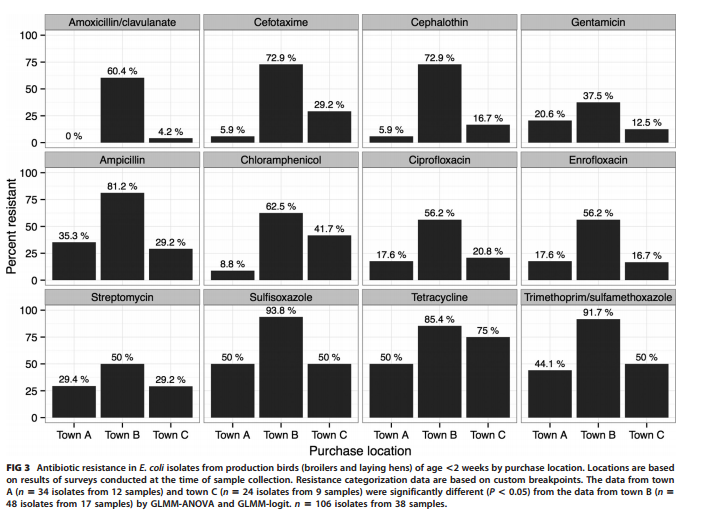 A strain jointly resistant to the 4 drugs was exclusive to a subset of isolates from production birds (7.6%) and coop surfaces (6.5%) and was associated with a particular purchase site. The prevalence of AR in production birds declined with bird age (P 0.01 for all antibiotics tested except tetracycline, sulfisoxazole, and trimethoprim-sulfamethoxazole). Farming status did not impact AR in domestic environments at the household or village level. Our results suggest that AR associated with small-scale poultry farming is present in the immediate production environment and likely originates from sources outside the study area. These outside sources might be a better place to target control efforts than local management practices. The authors found that poultry production and quality varied greatly over time, characterizing production in villages as going through a “boom and bust” cycle. They also quantified E. coli isolates in samples from poultry and the surrounding environment, then found which of the isolates had resistance to 12 common antibiotics. Table 2 from Braykov et al, 2016. Some main findings from this paper are that production poultry had a higher proportion of resistant isolates than household poultry. In general, the resistant phenotypes decreased as the birds aged. They also recorded locations from which the poultry originated, finding that a particular town outside of a large city had higher instances of resistance in the chicks they provided. Interestingly, resistance levels didn’t differ significantly between birds that had antibiotics supplemented by farmers versus those that did not. Overall, a really interesting and thorough study. The authors tried to bring together a lot of interdisciplinary aspects of the antibiotic resistance issue pertaining to their system and characterized as many facets of this system as they could think of. I also think it’s cool that they published in a new open access journal, although I know nothing about mSphere. For more on microbiology of the built environment of poultry, check out this post from our own Katie Dahlhausen on her sampling efforts at UC Davis. via Flickr under public domain license. Interesting that they didn’t find a significant difference between antibiotic-supplemented and non-supplemented chickens. In essence it appears they found very similar things – it appears that even when you change to organic and reduce antibiotic use, a) unless you totally disinfect your farms, the circulating resistant high-fitness strains remain and b) if you get chicks from the same source, the chicks bring the resistant isolates. Once the organic farms started brooding their chicks, VRE was reduced. For the life of me I can’t find these written up for publication though I’m sure it’s somewhere, or I’d link those. My brief look through the literature of antibiotic use and resistance in farms suggested a mix of findings and it wasn’t easy to work out what factors were contributory. Anyway thanks for posting the journal club. It’s a great idea so others can benefit outside the group, and I’m going to ask our lot if they’d consider doing something similar. Awesome, glad you liked the post! Thanks for the super informative comment too. It is certainly surprising and interesting that they didn’t find differences in resistance in AB-supplemented v. not supplemented chickens. I think the origin of the chicks is a really important point that I hadn’t even thought of until I read it in this paper. Definitely think this topic needs more work, so I’m interested to see what the real story is. I live in Manta Ecuador. I am trying to find hens for my yard. I can only find one place that has them and it is filthy. Can you tell me where I can obtain 6-8 hens that are 4-6 monthes old? I have the yard, coupe, feeder, waterer and food ready. I will be using RopaPoultry Oregano Oil and Organic vinegar in their water and Diatomaceous earth for lice/mites. They will be getting plenty of kitchen scraps, vegies and melons, along with plenty of bugs and maggots. I have a yard of 100ft by 50 for them to run in and plenty of fresh hot compost.